Coquihalla/Fraser Valley – With the Canada Day long weekend approaching, motorists are reminded to expect delays on Highway 5 (Coquihalla) between Hope and Merritt due to two major road and bridge construction projects. 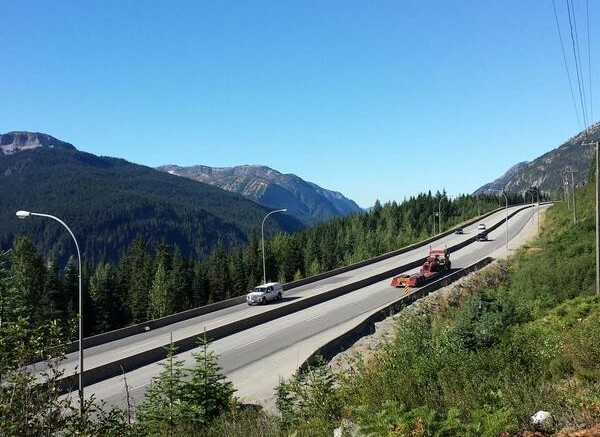 Work on the Box Canyon chain-up area continues 40 kilometres north of Hope, while a further 13 kilometres north, crews are resurfacing four lanes of the Dry Gulch Bridge. At Dry Gulch Bridge, three lanes will be open to traffic at all times. During the Canada Day long weekend, traffic volumes traditionally peak at more than 2,000 vehicles per hour. Motorists should plan ahead and check live traffic conditions on DriveBC or consider avoiding travel during peak periods. Motorists are asked to please watch for and obey posted construction signs and traffic management personnel, and adjust travel speed accordingly. Be the first to comment on "Construction Delays On Coquihalla Between Hope and Merritt – Canada Day Weekend"